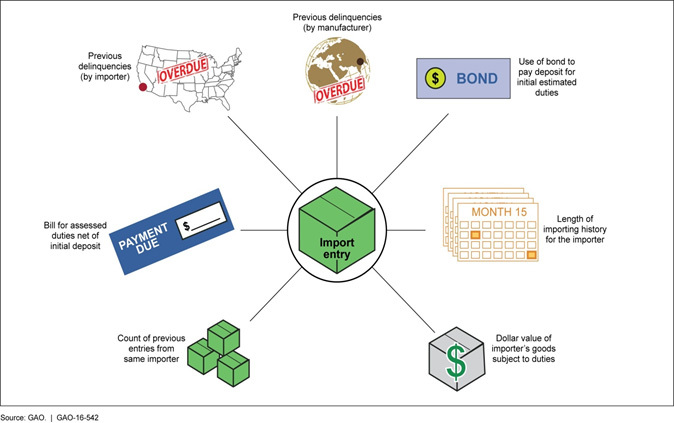 Although CBP’s collection rate is over 99 percent for duties overall, CBP is able to collect less than 50 percent of antidumping and countervailing duties that have been retroactively assessed in excess of bonds or cash deposits. We concluded in the report that the chief obstacle to ensuring collection of such duties is the difficulty of obtaining adequate security (cash deposits, bonds, or other instruments). This problem appears to have been exacerbated in some cases by unscrupulous importers who imported knowing they were likely to incur duties not fully secured by bonds or cash deposits following retrospective duty assessment and who then absconded when payment was due. Despite the Treasury Department’s clear diagnosis of the problem confronted by CBP nearly a decade ago, the U.S. Government Accountability Office’s (GAO) recent report on antidumping/countervailing duty collection (gao.gov/products/GAO-16-542) indicates that the problem has significantly worsened over time – with CBP able to collect only around 31 percent of antidumping/countervailing duties retroactively assessed (pkrllp.com/international-trade/why-is-only-less-than-a-third-of-the-amounts-in-antidumpingcountervailing-duty-bills-issued-by-customs-collected/). All twenty of these importers have been sanctioned “meaning that CBP would require full payment of all estimated duties, taxes, and fees before any products subsequently imported by these importers could be released by CBP into U.S. commerce” (p. 19). Yet, the GAO reported that, in some cases, “importers continued to be involved with importing after being placed on sanction” (p. 20). The GAO noted that an importer of pure magnesium ingot from China with $169 million in outstanding duty bills “may have subsequently incorporated under a different name, enabling it to resume importing as a new entity” (p. 20). Another importer, found by GAO to owe $10 million in outstanding duty bills, stopped acting as the importer of record on merchandise but “continued to act as a consignee, meaning that another company imports goods that are delivered to” the importer (p. 21). Further, the GAO reported that through “Operation Lost and Found,” CBP “identified over 100 active importers with links to inactive importers with delinquent bills” (pp. 32-33). Accordingly, the GAO report, consistent with the earlier findings of the Treasury Department, appropriately focused on the nature of the importer as well as the nature of the imports themselves. The GAO observed that CBP has proposed revising “form 5106,” known as the Importer Identification Input Record, in order to obtain more information regarding importers that would further facilitate the identification of links between ostensibly independent companies. At the same time, however, the GAO explained that CBP itself expected these proposed changes, if made, “may have only a modest impact on the collection of AD/CV duty debt because CBP will accept revised forms with incomplete information,” and that “requiring importers to provide additional information would require a change in the regulation, which CBP does not plan to make” (pp. 34-35). In addition, Section 116(a) of the new law requires CBP to “prescribe regulations setting forth the minimum standards for customs brokers and importers, including nonresident importers, regarding the identity of the importer that shall apply in connection with the importation of merchandise into the United States.” Section 116(b) obligated CBP to submit a report to Congress no later than August 22, 2016 with recommendations for how to improve the information customs brokers obtain from nonresident importers and for establishing a system that would allow customs brokers to verify information provided to them by importers against information maintained by relevant federal agencies. With the augmented focus on accurate and complete information regarding parties acting as importers of record, the Trade Facilitation and Trade Enforcement Act of 2015 also addressed the lack of adequate security on risky shipments. Section 115(a) instructed CBP to establish a program, no later than August 22, 2016, “to adjust bond amounts for importers, including new importers and nonresident importers, based on risk assessments conducted by [CBP], in order to protect the revenue of the Federal Government.” As part of this program, Section 115(b) of the new law requires CBP to develop risk assessment guidelines to determine whether (and to what extent) to adjust bond amounts on importers and increase screening on importers. Importantly, these new provisions of law focus on actions that may be taken prior to and during import entry to guard against non-payment. The GAO’s analysis provides little guidance with regard to how CBP might collect the $2.3 billion in antidumping/countervailing duties already owed. To the extent this subject is addressed at all, the GAO identifies two successful initiatives that made only a minimal dent in the cumulative unpaid duty amounts: “Operation Lost and Found” resulted in $1.4 million in duty refunds that CBP owed to active importers being applied to the debts owed by delinquent importers and “a surge effort” resulted in the liquidation of import entries associated with inactive importers secured by bonds worth $14.2 million (p. 33). In terms of the efficacy of our trade remedy laws, addressing the $2.3 billion in uncollected duties is less important than taking affirmative, aggressive steps to reverse the deterioration of CBP’s duty collection capabilities – collections that have dropped from less than half of retroactively assessed amounts just a decade ago to less than a third today. For this reason, augmenting CBP’s utilization of tools to prevent unscrupulous importers from making unsecured entries and absconding when bills come due must be the priority. The most important new provision of law in the Trade Facilitation and Trade Enforcement Act of 2015 may turn out to be a small change that has garnered little attention thus far. Section 111(c) of the new law expressly authorizes CBP to now utilize advance information on cargo (provided through “10+2” requirements) for “commercial risk assessment targeting.” This provision works hand-in-glove with the enhanced risk assessment required of CBP by Section 115 of the new law and builds in additional time for the agency to identify shipments that might merit additional scrutiny and review. Section 111(c) maintains the prohibition on the use of such information for “any commercial enforcement purposes,” but there is little reason why advance information regarding cargo would, on its own, form the basis for enforcement. Instead, CBP’s analytical teams can use these data to flag risky shipments for individual ports well in advance of a container’s arrival. Whether enforcement action would be taken regarding such shipments remains contingent upon inspection of the materials provided to the agency at entry, along with the actual contents of the goods offered for entry. At a minimum, the new access to these data for “commercial risk assessment targeting” purposes positions CBP to more easily identify risky shipments prior to entry. The enactment of the Trade Facilitation and Trade Enforcement Act of 2015 has created the framework for CBP to implement essential new tools to address the under-collection of antidumping/countervailing duties. The adoption and utilization of these tools holds significant promise in reversing the embarrassing deterioration in CBP’s ability to collect these duties.